The State government has drawn up a proposal to carry out improvement works on the Pallavaram lake and the Keelkattalai lake – both situated along the Pallavaram–Thoraipakkam radial road. 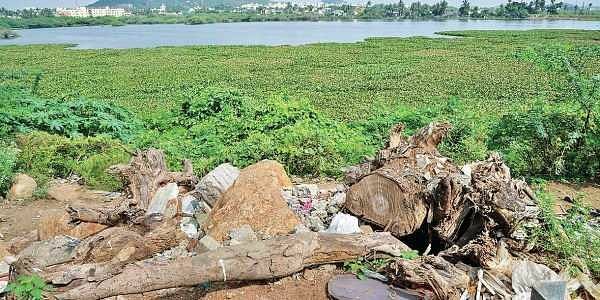 CHENNAI: The Pallavaram ‘periya eri’, one of the heavily damaged lakes in the city’s southern suburbs around Tambaram, on which garbage has been dumped for four decades, is all set to be spruced up. The State government has drawn up a proposal to carry out improvement works on the Pallavaram lake and the Keelkattalai lake – both situated along the Pallavaram–Thoraipakkam radial road at a combined outlay of Rs 22 crore. A huge chunk of Rs 15 crore proposed to improve these two lakes comes as a loan part of a World Bank-assisted project. In addition, Rs 7 crore would be spent on a ‘bio-mining’ project to clear garbage from the Pallavaram lake alone. Officials of the department of Municipal Administration and Water Supply told Express that the original sanction for the proposal to improve these two lakes at an estimated cost of Rs 22 crore was issued in 2015. However, after revision, it was brought down to Rs 15 crore. However, as the lake was under the maintenance of PWD, the Pallavaram municipality had to get a no-objection certificate from it, hence the delay. Recently, the PWD issued the NOC, which is why the proposal has picked up momentum. Of the estimated cost of Rs 15 crore, 60 per cent would be a loan from World Bank through its Tamil Nadu Sustainable Urban Development Project (TNSUDP), 30 per cent as grant from the State government and the remaining 10 per cent would be the Pallavaram municipality’s contribution. The project components include desilting, strengthening of bunds, stone pitching – installing granite stone blocks on the bunds - and installation of sluice valves on both lakes. An important condition agreed to by the municipality is that there would be no damage to the lakes. The TNSUDP of the World Bank aims to execute urban infrastructure projects in Tamil Nadu with an estimated outlay of US $600 million (around Rs 4,000 crore). While residents living around the Pallavaram lake are glad, activists are not happy about forcing people to meet a sizable chunk of the project cost. They said that as long as the lakes were with the PWD, attempts were not made to improve them. Now that the project is to be executed with World Bank help, they wondered how the local body would pay back the loan.